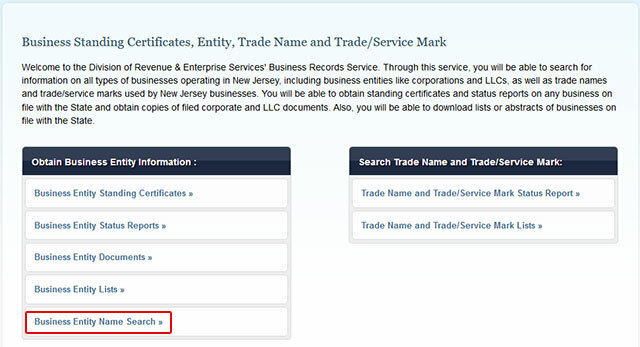 Below is a step by step guidelines on how to use the New Jersey business search page. 1. The first step is accessing the New Jersey business search page by clicking here. On this page, click the "Business Entity Name Search" link, as shown in the screenshot below. 2. The next page shows what you can search businesses by, either by name, keyword search or Entity ID. For this example we are going to search by name, so go ahead and click the "Business Name" link, as show in the screenshot below. 3. On the next page, there is a text field called "Business Name". In this example type in the name "CardCash". From there click the "Search" button, as shown in the screenshot below. 4. Once you click the "Search" button, it will display a list of results that match your search criteria. the results they display the name of the business, the Entity ID, type and incorporated date. It appears at this time, the system does not allow you to go any further. You cannot view the details of any of the business entities found in the search results. As show in the screenshot below. 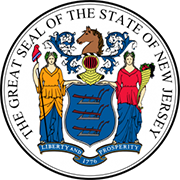 The Secretary of State of New Jersey is the constitutional office in the US state New Jersey. The Secretary of State of New Jersey oversees the duties of the Department of State of New Jersey which is the original office of the state. The current Secretary of State of New Jersey is Kim Guadagno.